I took the plunge, World's End notwithstanding, and went to see Baby Driver. Short version - if you sat through the trailers and said "hell, yeah" - the movie is exactly what they sold you. Go, watch it. That said, I'm torn. Where once in the past I was more amenable to "stylish" and directly artistic movies, I have much less patience with, say, Tarantino flicks, than I used to be. It's very overtly and deliberately stylistic, often enough in ways that call themselves to your attention. Yet, I've been thinking about aspects of it, its themes, its story, for the last couple days. A few notes on what to expect. Music runs throughout the entire thing. Baby, the main character, has tinnitus from a childhood accident that killed his parents, and nearly constantly keeps headphones in his ears, music playing. In the opening credits, Baby walks past graffiti and other markers that coincide with the music he's listening to. He remixes the conversations and planning meetings with his crime boss he owes - Kevin Spacey's "Doc". The music, and his sunglasses, are a barrier between him and his life of crime that he desperately seeks a path out of, while the music is also a reminder of his mother. Mr Wright dialed back the forced humor, to good effect. This is a tight and efficient story with little or no wasted time. Everything is important, and a number of "checkov's gun" moments are well disguised as character revelations and moments, only later being revealed for exactly how important they are, often in ways not obvious when they first come up. Most of the twists - it's a heist movie after all - follow the rule of "surprising yet inevitable" to good effect. The humor, when it comes, works. The driving. The trailers didn't lie - it's absolutely nuts. The characters are a bit pretentious, again, deliberately. Like the driving and action (though god save me from two-fisted rifle firing by some wee slip of a girl) it's one of a piece with how over the top everything is. Stepping back, neary every one of them is exaggerated, putting a face on to the world, with Lilly James' "Deborah" being the only character who is largely what she presents herself to be. Baby is, in many ways, also what we see, trying to present a different face to the world, and the criminals he works with. 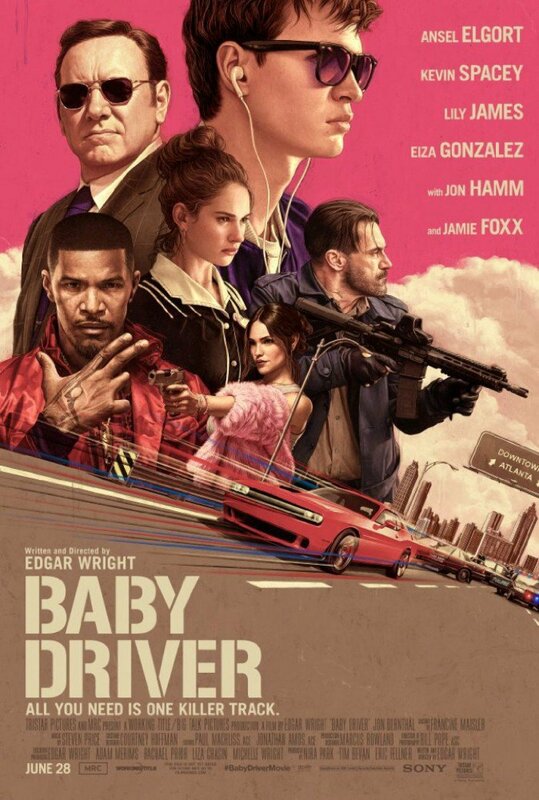 It's not much of a spoiler since it's a critical blurb in the first trailer, but the song "nowhere to run to" is absolutely emblamatic of the main theme of the movie - Baby trying to get out of this life of crime, and getting dragged back in. Unlike, in some ways, Shaun and Fuzz, and to a much greater extent World's End, everyone in this film gets what they deserve. For those who, with some justification, hate the Hero's Journey and reluctant hero tropes that seem to infect Hollywood movies these days, the movie starts off firing on all cylinders getting away from a bank robbery. Baby's backstory - an all too typical "daddy was abusive" bit - is sketched out in a bare minimum through the movie, and you discover each character through their actions. He's already a gifted driver, he's already looking to get out, and thinks he's near that goal. It's the complications of falling in love (please spare me from the line "I don't think I'm good enough for you...), being dragged back in against his will, and finally, dealing with a chaotic and murderous member of the team, that unravels everything. It is, in the end, a movie about the consequences of evil and nihilism, and of taking responsibility for one's actions and choices. Look. I don't really think this will ruin the movie if you're inclined to like it, but it is a spoiler, if a bit vague. In the end, Baby finds his salvation in stopping running, facing the consequences of his actions. He, and Deborah, are the only ones who live - she the innocent and he, while not so much, being saved in large part by his actions to save others, so that they stick their necks out for him. Given my recent kick of listening to Jordan Peterson's lectures on how facing the good and evil in ourselves, and facing what we fear is the only way to find meaning, that is very appropriate.